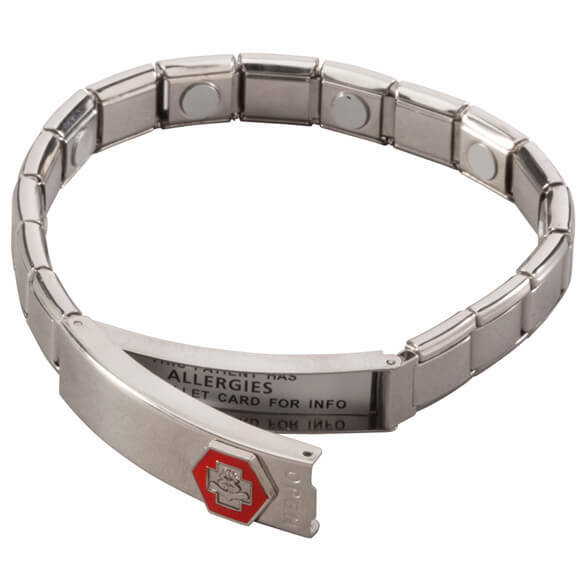 Lifesaving medical ID bracelet with magnets combines peace of mind with magnetic therapy. 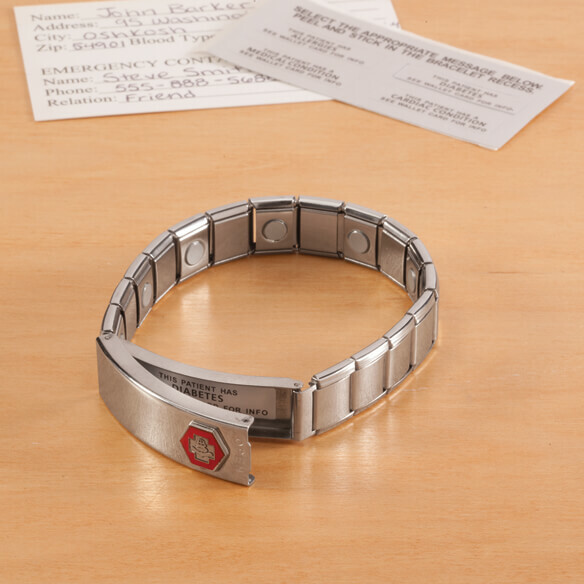 Stainless steel bracelet features a medical alert symbol on a flip-up tab — when opened, it displays your medical condition and instructions to view your wallet card. Stretch bracelet features 9 therapeutic magnets embedded inside, believed by many to help promote circulation for optimal health. 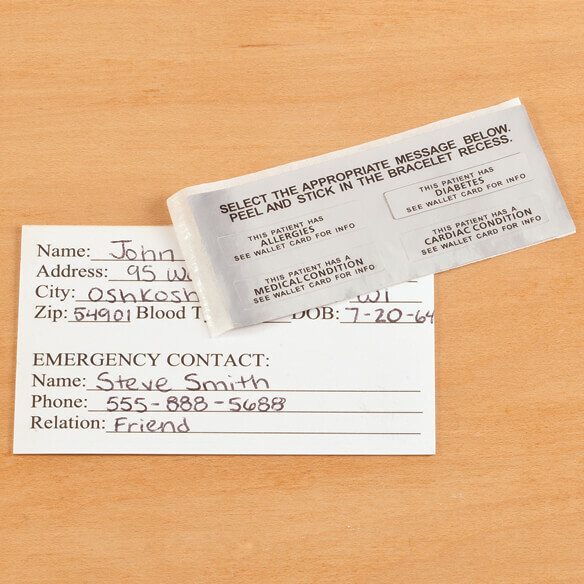 Includes stickers pre-printed with medical conditions and a wallet card to record emergency contact information. One size fits most stretch bracelet. Choose from men's or women's. 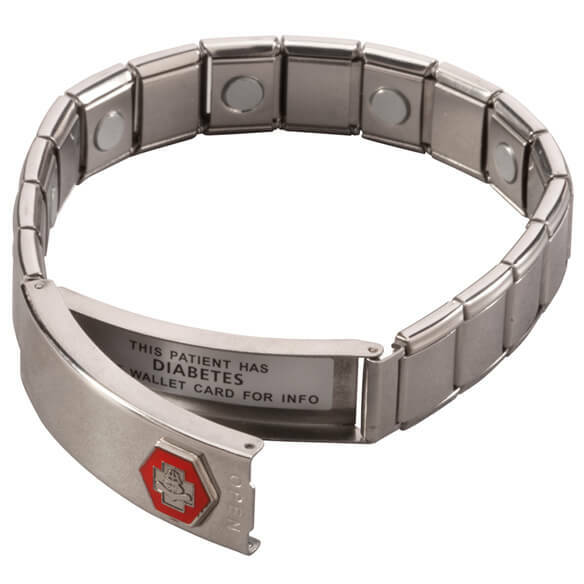 I am well pleased with the Medical ID Bracelet that i bought from this company. The Bracelet is just like it was shown in the picture. The delivery was fast and accurate. i would gladly recommend this company to anyone . Already purchased one buying another one for another family member. I have a medical condition i need one. Much needed and very reasonable. my cousin has a lot of medical problems,and I thought this would help her. Seems like good quality, and fair price. Because of its stretch band. I picked these items to help identify existing medical conditions to emergency personnel should the need arise for two of my family members. These items were reasonably priced. Ordering for someone else. Have one for ,yself. I have type 2 diabetes, congestive heart failure, and recently had a pace maker put in. I feel that this is important information that emergency personnel should have if I can't tell them. I have deadly heath issues, emergencie responders need this information. Price and ability to make everything available in case of emergency. I have medical issues and can't remember my allergeries sometimes. Is this an Italian charm compatible bracelet? BEST ANSWER: Thank you for your question. It is not compatible to Italian charm bracelets. We hope this information will be of help to you. No. I do not believe so. Does the pre-printed conditions include addisons? BEST ANSWER: Thank you for your question. There are only four pre-printed conditions – and they are Allergies, Diabetes, Medical Condition and Cardiac Condition. With each one it specifically states See Wallet Card for Information. You then need to have the wallet card on hand. We hope this information will be of help to you. What is the size of the women’s bracelet? BEST ANSWER: Thank you for your question. The Women’s Bracelet is approximately 7" around the inside of it not stretched and 11” stretched. We hope this information will be of help to you. The links are not removable. We hope this is of help to you and apologize for any inconvenience. Could I use a regular watch band for this item? BEST ANSWER: Thank you for your question. The band is not removable. We hope this information will be of help to you. How large is the men's bracelet? BEST ANSWER: Thank you for your question. 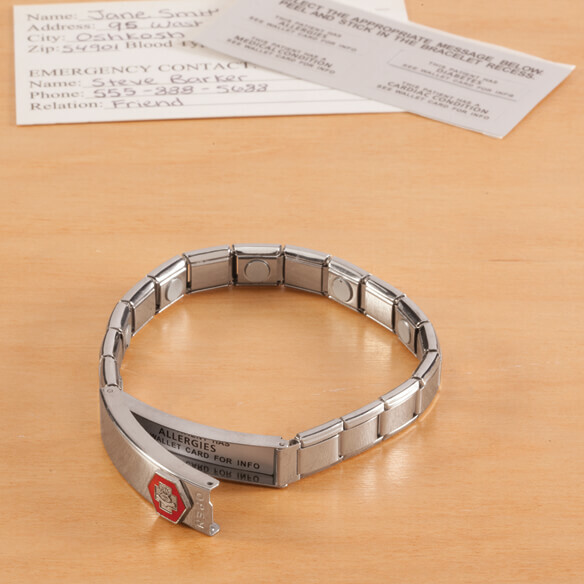 The Men’s Bracelet is approximately 7 3/16" around the inside of it not stretched and 11 3/16” stretched. We hope this information will be of help to you. I have nickel sensitivities ... is there nickel or nickel alloys in the bracelet? BEST ANSWER: Thank you for your question. It is very possible there is some nickel in it. It is made from stainless steel and that normally contains a small percentage of nickel. We hope this information will be of help to you. Can I wear the bracelet t to .improve my circulation? BEST ANSWER: Thank you for your question. The magnets are believed by many to help promote circulation for optimal health. We hope this information will be of help to you.